Wilhelmian penetrates the depth of the Palace, and runs into the Spiral Organ, the Denizen who controls the Corpse Collector, who gives her information. Decarabia sends an emergency message to the commanders on the ground to return their troops at once. 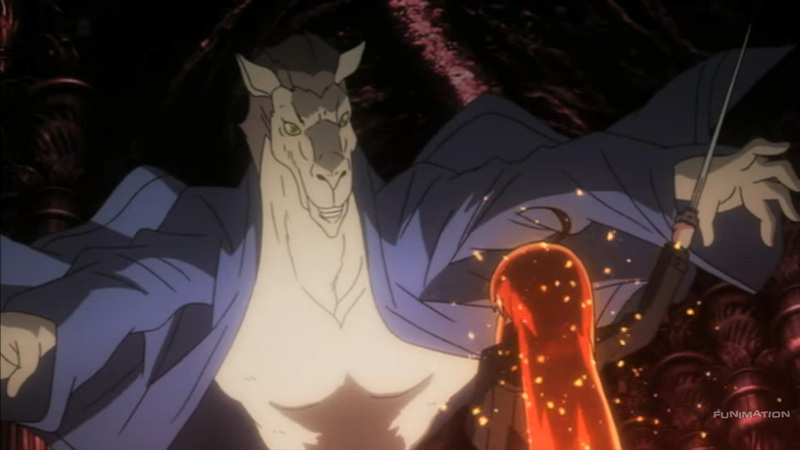 Uvall attacks Shana, but is eventually overwhelmed when Shana realizes her true power. Finally, Rebecca’s battle against Purson isn’t going well until planes full of Flame Hazes arrive overhead and and the Palace of the Stars falls to the ground. Hasn't anyone told you that Camels are bad for you? “Holy crap” is probably the best description of this episode. The Bal Masqué’s two commanders left at the Palace of the Stars are dead, and Decarabia, the Supreme Commander, is desperately asking everyone to return before it’s too late. Meanwhile, now that Shana has reunited with Wilhelmina, they’ll know what the Gate is for. My guess is that they’ll enter the gate to chase after Yuji and others, though I’m not sure how they’ll catch up. Isn’t Hecate the one controlling the pathway, and doesn’t it only appear within a certain perimeter of her? I guess we’ll find out anyway. And I think we’ve confirmed that the Spiral Organ (aka the Corpse Collector) is basically using the Bal Masqué to further his own goals, though to what end we don’t know. And we got another reminder that Yuji’s plans may not be necessarily in the Bal Masqué’s best interests either.